Years ago, a good friend of mine (Siera) and I found an awesome place called Foamhenge near where we were going to school. 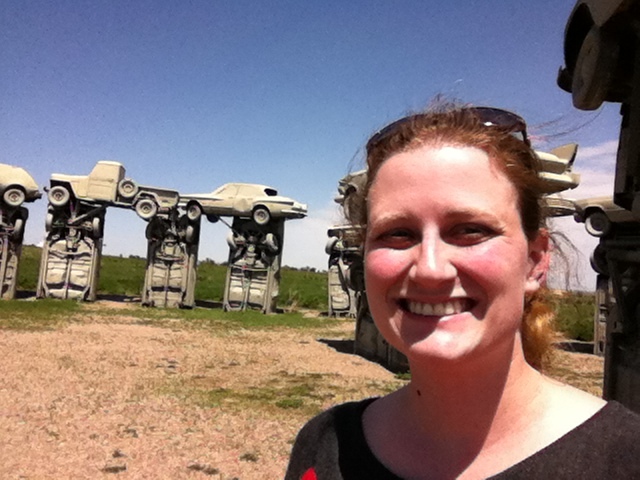 I recently relived that adventure in a whole new light by checking out Carhenge in Alliance, Nebraska (a mere 4 hours out of the way on our trek from Omaha to Colorado Springs). Carhenge was actually built by the Reinder’s family of Alliance to honor the memory of their father. The family came together and constructed this replica of Stonehenge and the attached sculpture gardens shortly after the patriarch’s death. The sculptor was Jim Reinder, a gentleman who had spent some time in England and become fascinated with Stonehenge. He wanted to bring that awe and mysticism back to the states somehow, and when the family started brainstorming how to honor their departed father, Jim saw his chance. The sculpture only took a few weeks to build and it had its great unveiling on the Summer Solstice 1987 in a large festival hosted by the family featuring songs, poetry and even a play produced by the Reinder family. Carhenge is now supported by a local group called the Friends of Carhenge. Many locals in Alliance were less than excited by the Stonehenge replica – considering it was made of junk and many thought it unsightly. They sponser an awesome little gift shop with tons of Roadside Trinkets for the road tripping aficionados and drinks and snacks (which is nice because Nebraska in June is H.O.T.). As far as roadside attractions go, I considered this one worth the drive. It falls into “classic American kitsch.” I mean, I just kept thinking, why would you even make this (answer to that above)?? But someone did. Not even one someone. A whole family. The sculpture garden behind it was ok too, but definitely not worth a trip on its own. I felt like the family just had some extra cars and didn’t know what to do with them, so they half buried some and made random sculptures of a few others. The fish sculpture made from car parts, made by some random dude who won a $2500 prize from the family, was pretty cool. And if you come this far, you can drive about 2 miles further down the road (heading away from the city center) and check out a really odd little rest stop. 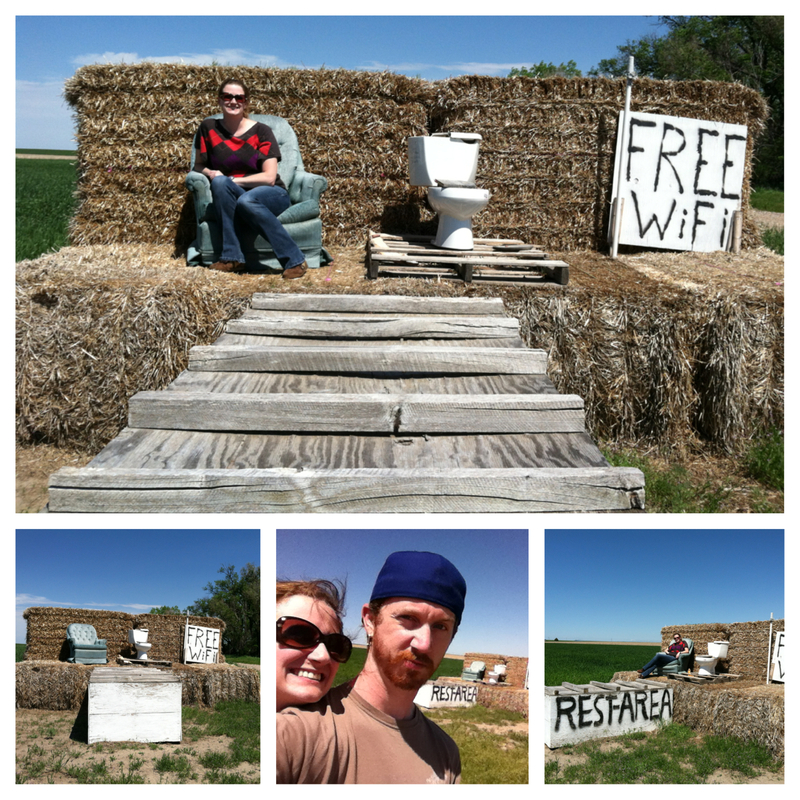 It’s a toilet and a recliner on a couple of bales of hay. It boasted free Wi-Fi, but Tim and I couldn’t seem to pick it up on either of our phones or his iPad. Needless to say, we opted to use the facilities back in town. Maybe just squeeze your legs together for a few more miles…. For more information about Carhenge, check out their website here. 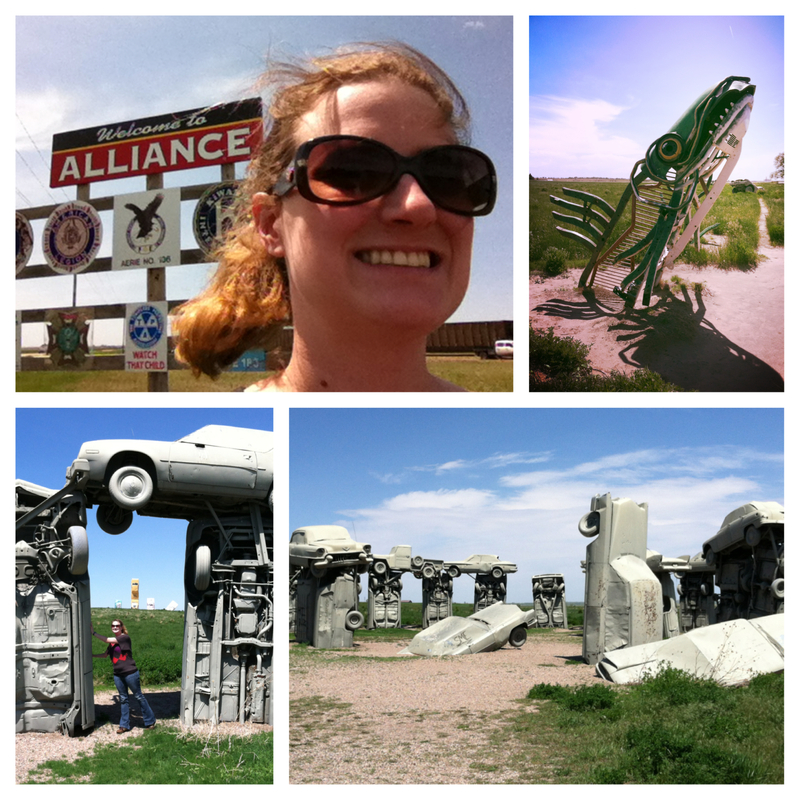 This entry was posted in Roadside Attraction and tagged alliance, Americana, carhenge, free attractions, Nebraska, roadside, roadtripping, stonehenge. Bookmark the permalink.